The BONSAI URN is the eco-friendly portable cremation urn which gives you a new option to honor your loved ones cremated remains with growing memories. 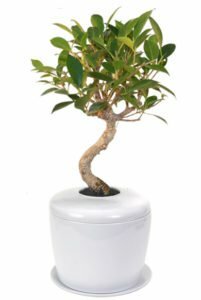 This beautiful porcelain ceramic cremation urn utilizes our patented growing system that allows you to grow this lovely Ficus Retusa Curved Trunk Bonsai Tree. The roots will slowly grow into the cremated remains, adding sustenance to the environment and your loving memories. The Bonsai Urn is eco-friendly and is designed to store the cremains of people and pets. Also known as Banyan Fig and Taiwan Ficus, the Ficus Retusa has small, dark green leaves which alternate up the stem and which are more oval than the Benjamina. Grey to reddish bark dotted with small, horizontal flecks, similar to tiger-like markings. All have heavy trunks and all are trained in the traditional curved shape. Among the most tolerant, versatile and trouble-free bonsai tree. Approximately 6 years old and 8″ tall. Keep Indoors or grow Outdoors when temperatures are over 50 degrees F.